Watching chefs Roberto Galbiati and Antonio Manetto in the midst of their playful banter, it’s not hard to discern where they hail from. “The pastas from northern Italy feature rich and flavourful meats”, boasts Roberto, former head chef of Da Paolo Group. Without missing a beat, Antonio fires back by promptly reminding us that Neapolitan-style pizzas from the south, are in a class of their own. As previous owner of Italian restaurants Bella Pizza and Bella Pasta, he takes immense pride in showcasing the region’s light and fresh flavours. When these two culinary stalwarts come together to start Acqua e Farina, what you get is an amalgamation of the distinctive cooking styles and flavours from both northern and southern Italy. And no, you don’t have to take sides. 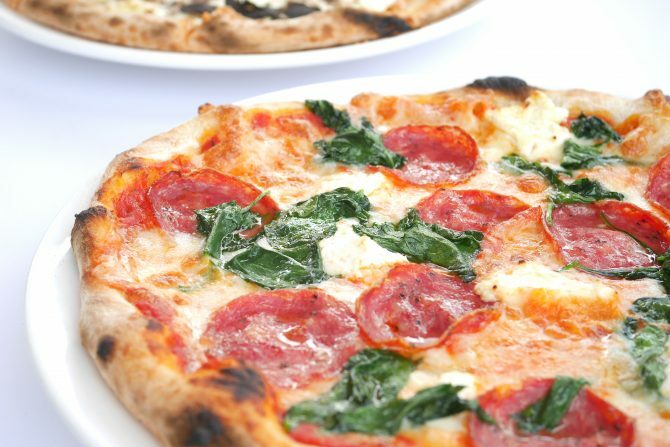 Pizza Acqua e Farina ($25) is a classic Neapolitan-style red and white base pizza with familiar yet comforting flavours. Like a gastronomy lesson set to the sips of the fruity Montepulciano d’Abruzzo 2014 Masciarelli, we plunged into savouring the signature dishes of the restaurant. From south, Pizza Acqua e Farina ($25) is a classic Neapolitan-style red and white base pizza with familiar yet comforting flavours. The dough is left to rise for at least 30 hours, before being kneaded by Chef Antonio. What results is a toasty yet thin crust — the way it’s usually done in Naples — enlivened by zesty tomatoes, mozzarella and ricotta cheese. 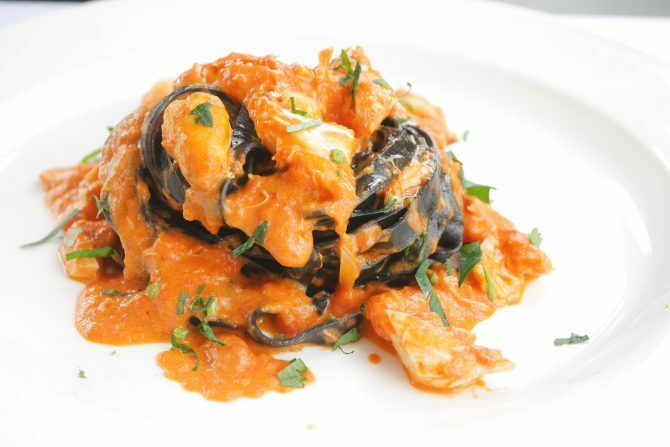 The most memorable dish of all had to be the Fettucine Nere alla Polpa di Granchi. I found myself gravitating towards the cuisine of the north, with its robust flavour profile. For instance, the Barca Salsiccia ($25), also known as the ‘Sicilian boat’, is an open-face dish where tomato, sausage and mushrooms are nestled in a crusty bed of dough. The piquant pork sausages, made in-house, were lightly spiced and tasty. 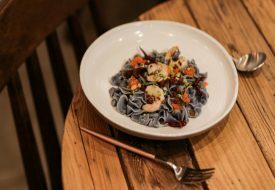 The most memorable dish of all had to be the Fettucine Nere alla Polpa di Granchio ($23), where smooth ribbons of homemade squid ink pasta are swirled in creamy tomato sauce and generous chunks of crab meat. The firm yet bouncy mouthfeel of the fettucine pasta took the dish to the next level — you have to experience it for yourself to know. The milky panna cotta was our favourite of all. For a sweet finale, we were served the Piatto di Dolci ($14). 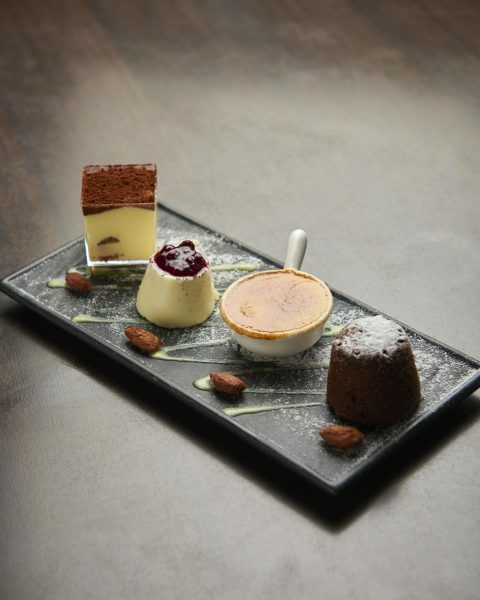 Petite versions of Italian desserts like creme brulee, lava cake, panna cotta and tiramisu all made their appearance, with the milky panna cotta being our favourite of all. 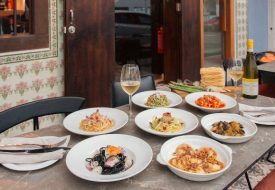 If home-style, delicious Italian food is what you’re after, a meal at Acqua e Farina will satisfy and likely educate you too.